St Tropez off to a Flying Start…. The call to the sea and the deep blue! For the 7th edition of the 900 Nautique, pressure is on for the Société Nautique de Saint-Tropez. Entries have soared for this event from the moment that registration opened in November. This nonstop race around the Mediterranean holds its appeal to those keen on offshore racing. Since its creation in 2010, the Société Nautique has never had so many entries. At the time of writing, three months from the event, over thirty boats have registered. The growing number of entries is due to this year’s innovation that opens the event to solo sailors who will complete on a shortened course of 400 nautical miles. In response to these high numbers and for logistical reasons, André Beaufils, President of SNST and Georges Korhel, Race Director, had put a limit on the number of participants to 30. But as enrollment numbers have increased, the organization has had to revise this ceiling. Thus, at present, thirty-four boats have responded to the call of the sea comprising twenty single-handed competitors and fourteen crewed teams. This race is part of the UNCL event calendar for the IRC Offshore Racing Championship 2016 for both crewed and single-handed teams. 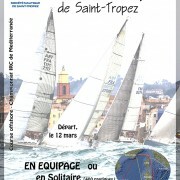 Both starts will take place in Saint-Tropez, March 12, 2016. The course remains the same as in previous years. The boats will sail around 900 nautical miles from Saint Tropez, course depending, passing around the Balearic islands, Sardinia and Corsica. To optimize the success of the event, the race committee has several course options. The final course will be decided according to meteorological conditions on the eve of the start. Similarly, the route can be modified during the event according to possible changing conditions. No stranger to this event is Christian Deschepper’s PEIPS present since 2010 becoming the most loyal participant ahead of Francesco Conforto on PEGASUS (5th time participant), Pierre Ortolan and PATITIFA (4th time participant), VOR 70 Lionel Péan (3rd time participation, winner and 2015 record holder), ANSHA of Matteo Carli Roy, XANTUS Bastien Brouwer (2nd time participant) and ASTA LA VISTA, Daniel Tinmazian , third time in the event as crew … New entrants, FEELING GOOD Paul Camps, JUBILIATIONS Arnaud Vuillemin, FIRST LADY Jean-Pierre Dreau, MATAF Jean-Yves Legall, MAVERICK Oliver Cotterel, PATRICIA II, a pogo 40 with Mario Girelli, and OZ, an open 60 Mikhail Agafontsev, to name a few. .. The outstanding record for the 900 Nautique is 3 days 8 hours 2 minutes 17 seconds! There is a new course and new time to be established for the single handed sailors, turning a page on the event. Watch out for Richard Delpeut on WALILI who has completed the two proceeding events double handed. Without doubt a strong adversary, he finished second in the Transquadra 2014-15. The single-handed sailors will race a course of approximately 400 nautical miles between the mainland and Corsica, to be defined by the race committee on the eve of the first race. Competing are ART IMMOBILIER CONSTRUCTION with Daniel Dupont, BOULINOU of Eric Bompard, BROCELIANDE of Denis Bouan, COCO of Frédéric Ponsenard, EPSILON with Laurent Favreau, EURO-VOILES with Christophe Barrue, EXPRESSO 2 with Guy Clayes, GIVE ME FIVE with Adrien Follin, GREGAOU with Laurent Pellecuer, HOKUA with Frank Paillet, JANIE PHILIP with Laurent Camprubi, JOOPE with Olivier Roman, LOEN GOUEZ with Jean-François Faou, NAUTIPLUS GEROUL with Roland Montagny, POCOENA with Erik Nordborg, SEDNA with Yves Dupont, TELEMAQUE with Eric Merlier, TINTOREL with Michel Cohen, WALILI with Richard Delpeut and a FIGARO 2 (name to be announced) with Pierre Quiroga. 73 yachts competing for the ARMEN Festival in 2016 !!! For nearly forty years the craze for the ARMEN Festival has remained unabated! Indeed, for the 39th edition and a few days from the first race, seventy-three yachts are registered for the event, which combines three disciplines: Sailing, Skiing and Art. On board, more than 500 crew will take part on the weekend of February 27, 28 and March 5,6, 2016. An art exhibition, headed by renowned sculptor, Cécile de Kock is open to the public at the Salle Jean Despas, Saint Tropez from February 27 to March 6 where thirteen artists, painters and sculptors, as well as works from the crew of the competing yachts will be exhibited. Worth noting is that the ARMEN Festival on-water results count towards the IRC Mediterranean championship established by the National Union for Ocean Racing (UNCL). The battle begins as does the conviviality and hospitality of the Société Nautique de Saint-Tropez on Friday, February 26 at 19h00 with the opening of Armen Festival and associated art exhibition. The following Saturday, February 27 racing will include a round trip to Cavalaire. Weather permitting….